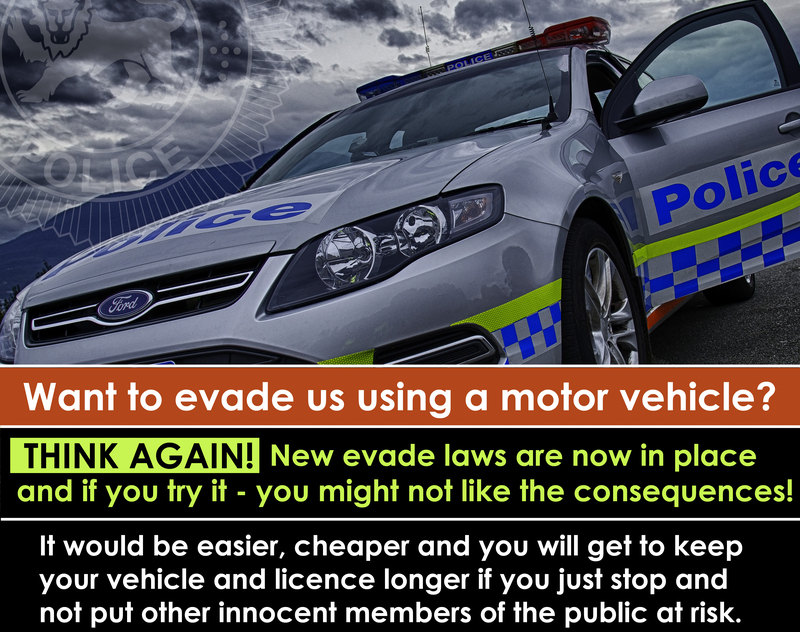 New evade laws are now in place and anyone why wants to try and evade us using a motor vehicle might not like the consequences! Evading police with aggravated circumstances has been included in the new laws. This applies to drivers who evade us and are driving dangerously or recklessly, are drink or drug driving, or whose drivers licence has been suspended or disqualified. Evading may be deemed aggravated where the vehicle is stolen or the driver has committed another serious offence or is breaching bail. There are minimum periods of driver licence disqualification for offending drivers. A first offence driver will be disqualified for at least 6 months, for a second offence the driver will be disqualified for at least 12 months. If the offence is aggravated, the driver will be disqualified from driving for a minimum of 2 years. Increased fines include a minimum fine of $1,590 for a first time offender. The minimum fine for a second offence is $3,180. Evading us with aggravated circumstances is a minimum fine of $3,180 up to $15,900. We can arrest offenders who we believe on reasonable grounds to have committed and offence. And we now have up to three months to locate and seize a car used in an evading police offence. For a repeat offender, the car can be automatically forfeited and sold or destroyed. Where the driver is not located but the car is, we can seize the car until the driver is identified. If the driver is not located, we may also have the car forfeited and sold or destroyed. Our advice is don’t try to avoid apprehension or interception. It’s simply not worth it. The new penalties have increased to reflect the seriousness of evading police and the danger fleeing drivers pose to the public. In addition, any fine, disqualification of the loss of your car would most likely exceed that for the offence which the driver was being intercepted for in the first place. This page -- https://www.police.tas.gov.au/what-we-do/traffic-policing/traffic-tuesday/27-new-evade-laws/ -- was last published on October 2, 2017 by the Department of Police, Fire and Emergency Management.